Caramel Chocolate Brownies are dense chocolate cakes, dripping with delicious hand-made caramel, so they require the same attention to detail as do other lighter cake flavors. Your caramel chocolate brownies will be made from scratch from customer-tested recipes with the freshest and highest quality ingredients. Did you know your Cake Art chocolate has a higher cocoa ratio than the chocolate you can buy at your local grocery store? 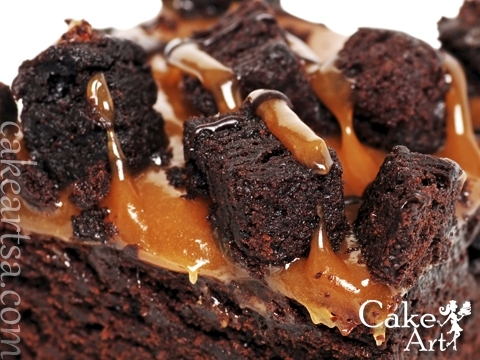 In addition to caramel chocolate brownies, you’ll also find classic brownies and iced cake brownies in our bakery case. However, everything is baked fresh so we do run out. Please come by Cake Art in San Antonio, Texas or call us at (210) 277-0308	to make sure we have caramel chocolate brownies on hand. Need something special? Click Ask a Chef and let us know. Thanks for giving us the chance to be your San Antonio brownie bakery!